Each year, hundreds descend upon Columbia College’s main campus to celebrate commencement. And as the college’s staff prepared for the day’s second commencement ceremony, there was an undeniable buzz near the main stage. Joe Brown, a Columbia College student, was at the foot of the stage, working through some details with college staff. 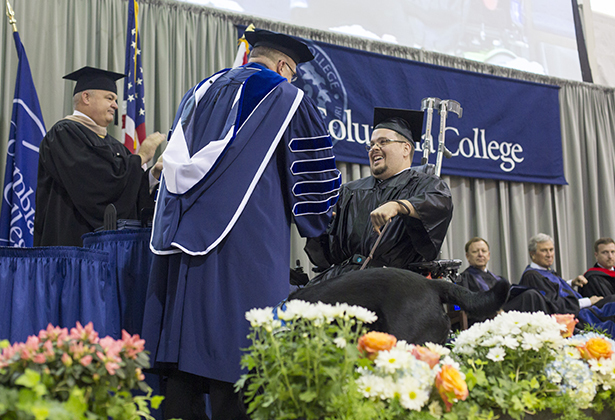 Brown, a wheelchair user, was receiving information about the college’s portable wheelchair lift; he also spoke with staff about the numerous people who made the trek to Columbia to see him receive his associate degree in general studies. It soon became clear that Brown’s entourage, which included friends and family from across the country, were anticipating something special. And then it happened. 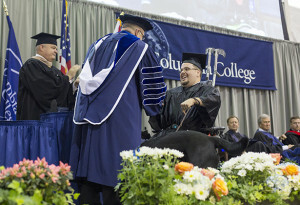 Caley Boyer, bookstore manager at Columbia College, presented Brown’s service dog, Z (short for Mackenzie), with a custom-made gown from Herff Jones (the college’s graduation gown provider). It was a magical moment, as Z, who had been with Brown for the past few years, was honored for her service. The plan to surprise Brown was hatched two years ago, during a conversation Boyer had with Pattie Storie, the college’s Herff Jones representative. In the weeks leading up to commencement, Boyer “snuck around,” working with Brown’s father to get Z’s measurements. Knowing this would be a special honor for a student Boyer describes as a fixture on campus, Herff-Jones created the custom gown free of charge. Ultimately, all parties worked together successfully to pull off the surprise. When Brown’s name was called during the second commencement ceremony, the crowd erupted with one of the loudest cheers of the day. Brown, clearly moved by the crowd’s response, pumped his fist in the air as he made his way off stage. In a day full of special moments, this moment shone particularly bright.